In my articles you will find a variety of graphics to help explain Buddhism. This page consolidates most of those graphics so you can find them easily along with a related article for more information! More graphics are coming as soon as I can make them, and write articles. Please note: These graphics are copyright by Alan Peto. If you would like to share any of these graphics to social media (Facebook, Reddit, Pinterest, etc.) you may do so with specific requirements that you provide full attribution that the graphic was created by me (Alan Peto) and a link back to this website. These graphics are not authorized to be downloaded and placed on other websites (such as on a blog post, attributed to yourself, etc.). If you wish to use it for a blog post, etc., or if you have any questions, please reach out to me and let’s talk! This graphic shows the basics of Buddhism all in one infographic. Specifically, it talks about the Four Noble Truths and the Noble Eightfold Path. Click the image to see it larger (your browser may give you a “magnifying glass” so when you hover your mouse cursor over the image, click it to see it full size in your browser). Buddhism, a Quick Intro. This infographic tells the two most important parts of the Buddha’s message. This graphic shows a number of “lists” and “numbers” found in Buddhism. In the middle you can find the Four Noble Truths, and the Noble Eightfold Path (complete with the Dharma Wheel graphic). Clicking this graphic will provide you a high quality PDF document for printing. This Buddhism cheat sheet features many different “lists” and “numbers” found in Buddhism. Having an easy to view graphic of all the major components of Buddhism is very helpful. This graphic is something I keep posted where I can see it, which helps me stay on the path. It features the Four Noble Truths, The Noble Eightfold Path, The Triple Gem, and The Five Precepts. 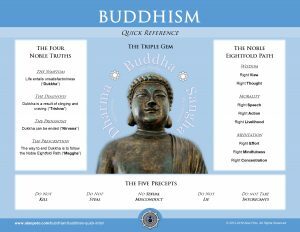 This Buddhism quick reference features the most important parts of Buddhism, so it is readily available to you. The Four Noble Truths, The Noble Eightfold Path, the Five Precepts, and the Triple Gem. The Noble Eightfold Path was explained by the Buddha as the fourth Noble Truth. It is the path towards Nirvana. However, it can often be difficult to remember all of the items, as well as what they mean. This graphic is meant to be printed out (clicking it will give you a high quality PDF for printing) and then “folded” along the lines so you can easily keep it in your pocket. Each item in the Eightfold path is color coded and grouped by Wisdom, Morality, and Meditation. The commentary for each item comes from Ven. Master Hsing Yun. 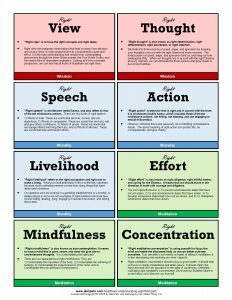 This Buddhism Noble Eightfold Path quick reference card is meant to be printed, then folded so it can fit in your pocket. That way you can have easy reference to the Eightfold Path, and commentary on each part! 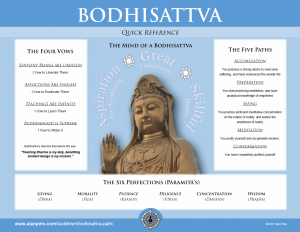 This quick reference card is the ideal companion on the Bodhisattva path! The major components of the Bodhisattva path are included on this single card. The Buddhist “Mala” is perhaps one of the most recognized items in the Buddhist religion. This string of beads can be as long as 108 beads, or even shorter. 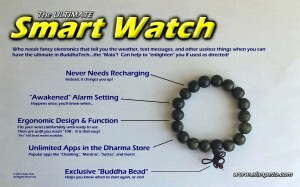 This lighthearted fun graphic shows how the wrist mala can be superior to any “smartwatch” out there! 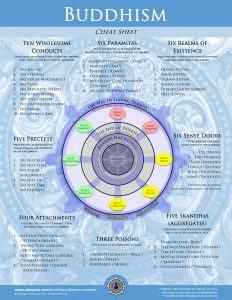 This graphic shows how the Four Noble Truths and the Eightfold Path are connected. 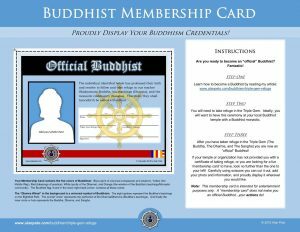 This “Buddhist Membership Card” is meant for entertainment purposes only, but is also a fun way to remember your commitment to being a Buddhist through the Triple Gem! Alan Peto is an author on Modern Buddhism, and Buddhist thought. His mission is to help others learn and practice Buddhism in our modern world. Click here to learn more about Alan. © Copyright © 1995 to 2019 Alan Peto. All Rights Reserved. Unauthorized use and/or duplication of this material/graphics without express and written permission from this site’s author and/or owner is strictly prohibited. Excerpts and links may be used, provided that full and clear credit is given to Alan Peto with appropriate and specific direction to the original content. Get notified by email of new Buddhism articles by Alan!